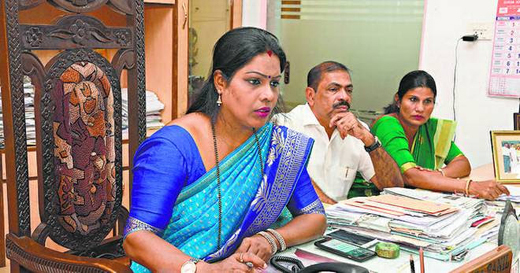 Mangaluru, Oct 28, 2017: Mayor Kavitha Sanil was on Oct 27, Friday was bombarded by a lady citizen who asked her if she has ridden a motorcycle on the city’s roads. The lady told Mayor Sanil to do so if she has never had the experience. During the Mayor’s phone-in programme, the caller asked her if she had travelled on the Balmatta-Pumpwell Road passing through Bendorewell-Kankanadi Junction. “I just had an accident riding a two-wheeler with my mother while negotiating potholes. My mother miraculously escaped from being crushed by a heavy vehicle and sustaining injuries,” the caller said emotionally. The woman said she too had sustained injuries and asked the Mayor who should be held responsible. When Mayor Sanil tried to reason with her about the continuous rain making it difficult for the authorities to repair roads, the caller asked why city roads could not be repaired if highways could be in such weather. The Mayor said steps would be taken immediately to repair the roads. Other matters : Mant callers complained about irregular water supply and damaged underground drainage connections, as a result of which waste water is flowing in public places at Surathkal, Alape, Padil and other areas. Mayor Sanil said a Rs. 54-crore project is planned to rectify defects in the UGD system while the Alape-Padil works are included in the ADB project’s II phase. Tenders will be floated next month and work will start soon, she said. Another caller spoke about water scarcity in areas around Kuloor-Kavoor Road because of damaged pipelines. Mayor said a new pipeline was being laid. Yet another caller complained about the display of flex boards across the city in public spaces, including on electricity poles, which goes against the ‘Swachh Mangaluru’ campaign. A resident of Mullakkad said attempts were on to convert petty shops into concrete structures in the area. One more complaint was about a mobile eatery near Bejai KSRTC bus station that was allegedly creating nuisance. To another caller, who complained about the incomplete widening work of Kudroli-Alake because of a narrow bridge, Mayor Sanil said initially the plan was to have a minor culvert. Later, the corporation decided to go for a major culvert. The work is expected to start by December.